For my article “Mobile PHRs compliance with Android and iOS usability guidelines”, a short mobile usability survey was conducted to validate the questionnaire in the article. The survey was created online using Google Forms and it was published on my Twitter account. Since some participants asked me if I could publish the results, here they are. The survey contained 13 questions that participants had to evaluate on a scale of 1-5 regarding their interaction with mobile applications. Participants’ age: between 18 and 51. Android Studio IDE is gradually improving. 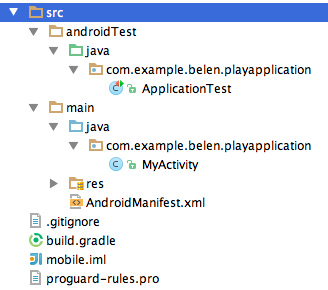 One of these improvements is the management of tests cases in the Android projects. In this old post: Test project setup in Android Studio, I explained how to prepare your Android project to run test cases. In the last versions of Android Studio, v0.8 and above, this process has been simplified. When a new project is created, a test package is automatically added. Tests will be saved in this package under the folder: /src/androidTest/java/<your_package>. Notice that the classes under test and the test classes are in the same package. Add your test classes in the test folder. To execute them, click on the package using the right mouse button and select the Run ‘Tests in <your_package>’ command. You can also run only one test class if you directly select it instead of the whole package.